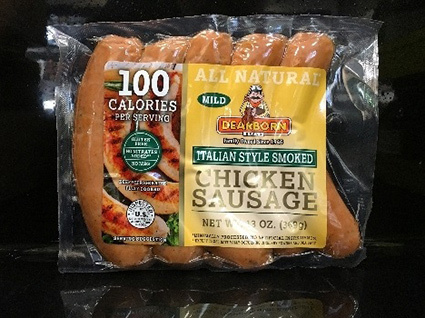 Dearborn Sausage Company has developed five new fully-cooked, low-calorie chicken sausages for grilling outside or preparing inside, or using in other recipes. The new products include an Italian Style Smoked Chicken Sausage in hot or mild flavors, Smoked Chicken Kielbasa, Smoked Chicken Bratwurst, and Smoked Jalapeno Chicken Sausage. Calories range from 90 for the Bratwurst to 110 for the Smoked Jalapeno Sausage. All five new products are gluten, nitrate, and MSG free and are available at the Dearborn Sausage factory, located 2450 Wyoming Ave., Dearborn Sausage retail store in Roseville, 29616 Gratiot, and stores across southeast Michigan where Dearborn products are sold.